Today I'd like to close my recent series of posts analyzing Apple's results over the past eight fiscal quarters with a quick look back at the Mac. Apple's line of Macintosh personal computers has been the company's most enduring product line and for most years of the company's existence the product line most critical to the company's financial success. Beginning in 2003, following the opening of the iTunes music store and the release of iTunes for Windows, the Apple iPod began to supplant the Macintosh as Apple's revenue and earnings driver. 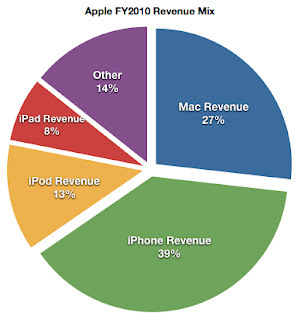 As recently as the first fiscal quarter of 2007, only four short years ago, the Apple iPod line of digital music players, iTunes music sales and iPod-related products represented 57% of Apple's reported revenue versus about 43% of revenue generated by the Macintosh line of personal computers and Macintosh-related peripherals and software. The iPod's success proved critical to Apple's ability to successfully complete what might be best described as an awkward transition from the PowerPC chip architecture to Intel chips. In late June of 2007, Apple released the original iPhone which further subordinated the revenue contribution from the Macintosh line and in April of this year the company released the Apple iPad. In Apple's most recent fiscal quarter, the fourth quarter of fiscal year 2010, the Apple iPod, iPhone, iPad and related product sales represented 70.5% of Apple's reported revenue, despite the fiscal year's 30% gain in Mac unit sales and 27% rise in unit sales in the quarter. Mac unit sales, software and peripherals represented 29.5% of the quarter's revenue results. The charts and associated table data below illustrate and indicate the Macintosh line's diminishing contribution to Apple's revenue totals while Macintosh unit sales continue to rise. Below the graphs we'll look at a few of the factors involved. Apple is a company known as much for defying conventional wisdom as it is known for several years of seemingly unbridled success. Already among the most highly valued enterprises in the world when measured by market capitalization, Apple is poised for perhaps the greatest year of revenue and earnings growth in the company's storied history. In the current fiscal year that began in late September, more than 60% of the company's revenue may be sourced from products that did not exit in the marketplace four years ago today. Apple's ability to grow revenue and earnings at rates that startle the financial markets is sourced in the development of new products that expand the company's revenue and earnings range and disrupt established industries. The Apple iPhone and the Apple iPad are the two most recent examples of Apple's approach to growth. From the original iPhone's release in 2007 to the end of fiscal year 2009 in September of that year, Apple's revenue and earnings growth from the iPhone was masked by the deferral of revenue and earnings over the anticipated economic life of each handset sold. Beginning with the first quarter of fiscal year 2010, Apple adopted new accounting principles that essentially eliminated the deferred revenue and earnings recognition on iPhone sales and released retrospective adjustments to the company's financial statements. The adoption of new accounting principles unmasked Apple's rates of revenue and earnings growth from the original introduction of the iPhone through fiscal year 2009. 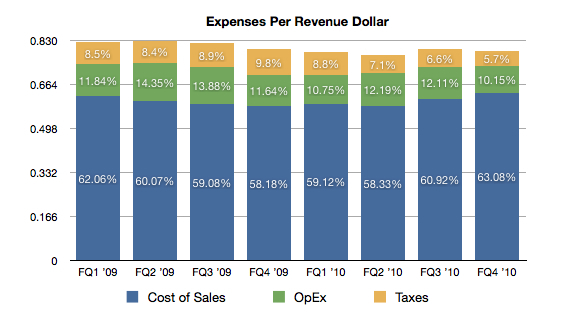 The graph below and its associated data table illustrate Apple's rates of revenue growth over the last five fiscal years beginning in late September 2005. The numbers incorporate the retrospective adjustments to recognized revenue from iPhone handset sales. Earlier today I posted the financial results for Apple's most recent eight fiscal quarters comprising fiscal years 2009 and 2010. The data for fiscal year 2009 is post the retrospective adjustments that followed Apple's adoption of new accounting principles for the Apple iPhone in the first quarter of fiscal year 2010. Apple's fiscal year begins at the end of September. 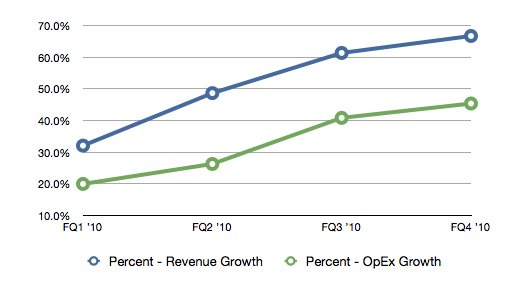 The graph below illustrates Apple's revenue performance by quarter for the same two fiscal years. The table data associated with the graph includes the rates of year-over-year and sequential revenue growth for fiscal year 2010. In both fiscal years fourth quarter revenue exceeds first quarter revenue (the holiday quarter) due to iPhone's annual upgrade cycle and the popularity of Macintosh computers on college campuses. The sharp rise in year-over-year revenue growth in the third and fourth quarters of fiscal year 2010 reflects the revenue benefit of the Apple iPad. For more information on Apple's revenue mix in fiscal year 2010, please see my October blog post titled Apple's FY2010: A Retrospective. In response to interest from members of the Apple Finance Board, I am posting Apple's quarterly results for the past eight quarters, comprising fiscal years 2009 & 2010. The numbers reflect Apple's post-retrospective adjustments for FY 2009 and combined the eight quarters represent perhaps the most dynamic two-year period in Apple's history. From revenue of $37.491 billion in FY 2008 to $65.225 billion in revenue in FY 2010, this eight-quarter period of revenue and earnings growth encompasses the first holiday quarter of subsidized iPhone contracts through AT&T to the second quarter of sales for the Apple iPad. As an independent analyst this eight-quarter period and its associated expense ratios are benchmarks for developing revenue and earnings models for the four fiscal quarters of FY 2011 (the current fiscal year) and in developing early estimates for FY 2012 that begins in late September 2011. Quarterly data from periods pre-dating this two-year period yield little relevant information due to dramatic changes in Apple's overall revenue mix from the end of fiscal year 2008 to today. 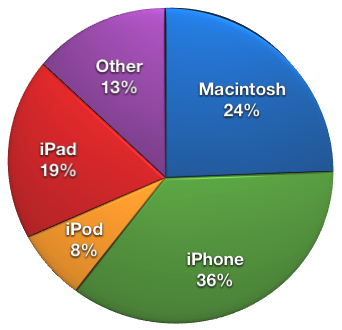 The information in the table below is derived from Apple's quarterly reports. The FY 2009 data reflects the retrospective adoption of new accounting principles for the recognition of revenue for the Apple iPhone. This change in approach to iPhone revenue recognition provides for much more accurate reporting of revenue and corresponding earnings from iPhone sales activity in the quarter in which it occurs. Please note the FY 2009 information differs from the quarterly recognized revenue and earnings reports originally issued by Apple prior to the adoption of the new accounting principles beginning with the first quarter of FY 2010. The new accounting principles were applied retrospectively for fiscal years 2007 through 2009. For a more detailed look at Apple's most recent revenue performance please see my October blog post titled Apple's FY2010: A Retrospective. Each fiscal quarter Wall Street analysts, tech industry journalists and AAPL investors hone in the company's gross margins as a percentage of revenue as if this one ratio has the greatest influence on the company's success. As an independent blogger/analyst I'm not one to dismiss the importance of gross margins in Apple's financial performance. But there are other factors such as tax rates and operating expenses that weigh heavily on Apple's bottom line results. The graph below illustrates Apple's gross margin as percentage of revenue and and net income as percentage of revenue for the most recent eight fiscal quarters or two fiscal years by quarter. 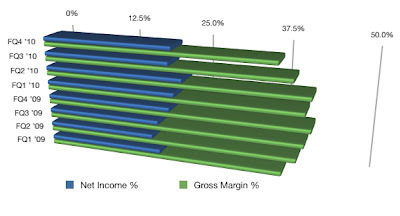 There's obviously a relationship between gross margin and net income performance. But the quarterly periods with the highest gross margin results are not necessarily the quarters in which Apple reported higher net income relative to reported revenue. For example, in the fourth fiscal quarter of fiscal year 2009 (the September quarter) Apple reported the highest gross margin in the eight quarters measured yet did not report the highest percentage of net income relative to revenue. In the forth fiscal quarter of fiscal year 2010 Apple reported the lowest gross margin in the eight quarters measured yet reported the second highest net income relative to revenue over the same eight quarters. Gross margin is an important ratio and performance metric yet to produce high ratios of net income relative to revenue other factors come into play. In FY 2011 I expect Mac unit sales growth to moderate from the 31% growth rate in FY2010. I expect Mac sales to growth a rate at least 2x the pace of growth of the industry. In fact, I expect Mac PC unit sales growth to represent more than 50% of the growth seen in the domestic market. In my view tablet products such as the Apple iPad will force a continued deceleration of PC industry growth in the domestic market and increasing revenue share of all PC sold for Apple. Rising enterprise adoption, aggressive product pricing and Apple's efforts at refreshing the Mac product lines more frequently are counter-weights to unit sales growth falling below 25% for the fiscal year. I expect Apple to at least maintain its current 20.7% share of consumer PC sales in the domestic market. In the 4th fiscal quarter of FY2010 both unit sales and revenue for the iPod line fell below prior-year levels. I expect this trend to continue into FY2011. For now I anticipate a 10% to 12% fall in unit sales for the fiscal year with the iPod touch partially offsetting a commensurate fall in revenue from the line. To the surprise of all analysts, iPhone unit sales growth in the September quarter roughly matched the pace of growth for the first nine months of the fiscal year. I expect this strong pace of 90% growth in unit sales to continue through FY2011. Apple ended the September quarter with only 3.2 million iPhones in the global channel, representing about 2.5 weeks of expected unit sales in the quarter. As supply reaches demand, the FQ1 numbers will benefit from an increase in channel supply as Apple exits the quarter with more iPhones in the channel than when the quarter began.